The SP 3400N/3410DN MICR provides small and medium-sized businesses an economical option for a reliable, high-quality MICR printer. With the SP 3400N/3410DN MICR, affordability does not come at the expense of valuable features such as high-speed processing and standard Ethernet connectivity.� The SP 3400N/3410DN MICR can tackle all check printing and general office printing by offering users the ability to use standard or MICR toner. 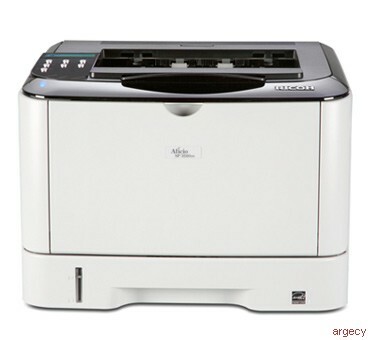 The SP 3400N/3410DN MICR is the entry-level printer in Rosetta Technologies' family of Intelligent MICR� - printers. With Intelligent MICR features like an online dashboard, the SP 3400N/3410DN MICR printer surpasses all other printers in its class. - - E-13B FONT: This font was created specifically for the SP 3400N/3410DN MICR printer. The printer-specific font ensures the highest achievable readability of MICR characters. - - CMC7 Font: This font was designed specifically for use with Rosetta Technologies MICR printers to produce the highest achievable readability of MICR characters. the SP 3400N/3410DN MICR printer engine, ensures high print quality, excellent toner yield, and long fuser life. and transfer voltage to eliminate high-speed reader/sorter issues with MICR checks. - - MICR Quality Guarantee: Rosetta Technologies ensures the readability performance of the SP 3400N/3410DN MICR printer when used in conjunction with approved MICR toner and check stock. Weight SP 3400N: 25.6 lb. ;�SP 3410DN: 27.6 lb. Standard & Bypass Tray: 16 - 30 lb. Optional Paper Feed Unit: 16 - 28 lb. capacities that are required for larger print runs. ENERGY STAR is a U.S. registered service mark of the United States Environmental Protection Agency. Adobe, the Adobe logo and Adobe PostScript 3 are either registered trademarks or trademarks of Adobe Systems Incorporated in the USA, and other countries. Apple, AppleTalk and Macintosh are trademarks of Apple Computer, Inc. registered in the USA, and other countries. Microsoft, Windows and Windows NT are registered trademarks of Microsoft Corporation in the USA, and other countries. All other brand and product names are trademarks or registered trademarks of their respective companies. The information and specifications contained in this document are approximate and subject to change without notice. This publication is for general guidance only. Product configurations in photographs may contain separately priced options. All Rights Reserved. 2/10.